Audio plug-ins manufacturer Waves has launched a mini-YGDAI interface card which will allow users of Yamaha digital mixing consoles to process up to 32 channels of audio with Waves plug-ins, via the company’s proprietary SoundGrid Server system. 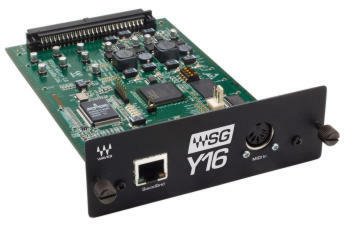 Announced at the Winter NAMM Show 2010, Anaheim, the WSG-Y16 card follows on from the existing Waves Y96K, eight in eight out, plug-in DSP card for Yamaha digital consoles. It will be at the Yamaha Commercial Audio exhibit at prolight+sound 2010, Frankfurt, Germany, stand 8F50. With SoundGrid bringing the worlds of studio and live sound closer than ever before, the introduction of the WSG-Y16 sees Waves bringing the networking and processing capabilities of SoundGrid functionality to the live sound realm for the first time. Using a SoundGrid-compatible PC as the plug-in host and Ethernet connectivity, the system allows users to run large numbers of Waves plug-ins with ultra-low latency. The WSG-Y16 card allows users of Yamaha LS9, M7CL, PM5D, DSP5D, 01V96, 02R96, DM1000 and DM2000 digital mixing consoles, as well as the DME64N and DME24N digital mixing engines, direct connection to the SoundGrid platform. Users simply connect the PC to the Yamaha mixer, route a channel to a WSG-Y16 channel and process the audio signal with Waves plug-ins hosted on the SoundGrid PC. Additionally, the WSG-Y16 supports MIDI input for plug-in control directly from the console or an external control surface. The WSG-Y16 supports 16-channel processing at 44.1 and 48kHz, with eight channel processing at 88.2 and 96kHz. Users of Yamaha products with a single MY card slot (01V96, LS9-16 and DME24N) can run up to 16 channels of audio via the WSG-Y16, the other compatible models allow up to 32. “Waves announcement of the WSG-Y16 card is another demonstration of how the connectivity of Yamaha’s current digital consoles allows integration with the latest technology from a wide range of manufacturers,” says Karl Christmas, deputy general manager, Yamaha Commercial Audio. “We believe that choice is one of the key advantages of digital audio and this product gives users who like the sound of Waves plug-ins the flexibility of using them alongside the Yamaha effects installed on the consoles. Waves Audio's SoundGrid gives users the ability to run large numbers of Waves audio processors using standard PCs via Ethernet, surpassing the specs of dedicated DSP-based platforms. SoundGrid offers low latency performance, which means users can take advantage of even more audio processors and CPU-intensive processors than ever before. Waves is leveraging the recent advances in both Ethernet and CPU technologies to provide better, more cost-effective performance for the pro audio and live sound markets.